(CNN) -- The Tamil Tiger rebels in Sri Lanka said Sunday they have "decided to silence our guns" as government forces closed in on their last stronghold. 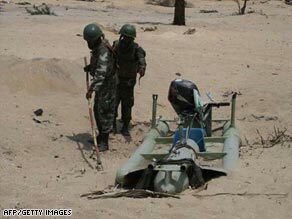 Sri Lanka's defense ministry says this handout photo shows troops with a captured Tamil Tiger craft Thursday. It is not the first time the rebels have called for an end to fighting when backed into a corner by the Sri Lankan military. But should they follow through on their announcement, the decision would potentially end a bloody 25-year civil war in the country. "This battle has reached its bitter end," Selvarasa Pathmanathan, a spokesman for the rebels said in an "urgent statement" posted Sunday on Tamilnet.com, a pro-rebel Web site. "It is our people who are dying now from bombs, shells, illness and hunger. We cannot permit any more harm to befall them. We remain with one last choice -- to remove the last weak excuse of the enemy for killing our people. We have decided to silence our guns," he said. Sri Lanka's President Mahinda Rajapaksa is expected to announce that "military operations" against the Tiger rebels have ended in an address to the nation from Parliament on Tuesday, the government said Sunday. The rebels -- formally known as the Liberation Tigers of Tamil Eelam (LTTE) (LTTE) -- have fought for an independent state for minority Tamils in Sri Lanka since July 1983. As many as 70,000 people have been killed since the civil war began. Government forces have trapped the remaining rebels in a small stretch of land in the north of the country -- and possibly thousands of civilians with them, an international aid worker in the country told CNN. The civilians are "under intense fire" and "essentially on their own" in the area, which the government says contains only rebels, the aid worker said. The Tigers themselves claim 25,000 civilians are dead or dying, a rebel identified as Col. Soosai said in a statement on Tamilnet.com. Independent confirmation was not possible since media are not allowed into the area. Reports indicated fighting had intensified as troops scrambled to clear a remaining 1.2 square kilometers before the government could announce that military operations had ended. The army destroyed six Tamil Tiger boats and killed 70 rebels in a lagoon on the western edge of a no-fire zone early Sunday, Sri Lanka's Media Center for National Security said. Sri Lanka's prime minister warned Saturday that his country "stands on the brink," as its soldiers cornered Tamil Tiger fighters in an assault which the United Nations fears is trapping more than 50,000 civilians on a small plot of coastal land. Government troops seized the last remaining coastal stretch under the control of Tamil Tiger rebels, the Ministry of Defense said Saturday. The seizure marks the total capture of coastline territory previously controlled by the rebels, it said, after army divisions advanced from the north and south to link up. The Media Center for National Security claims 50,097 have come out of battle zones. Sri Lankan President Mahinda Rajapaksa returned from Amman, Jordan, on Sunday. Rajapaksa was attending a summit of developing nations and the World Economic Forum. In an address to the summit in Amman on Saturday, Rajapaksa said the Sri Lankan armed forces had defeated the rebels. "I will be going back to my country Sri Lanka that has been totally freed from the barbaric acts of terrorism of the LTTE. This freedom comes after 30 long years," Rajapaksa said. Journalist Iqbal Athas contributed to this report.